Silicon Valley-based venture capital firm The Venture Reality Fund (The VR Fund) focuses on early-stage investments in virtual reality (VR), augmented reality (AR) and mixed reality (MR). 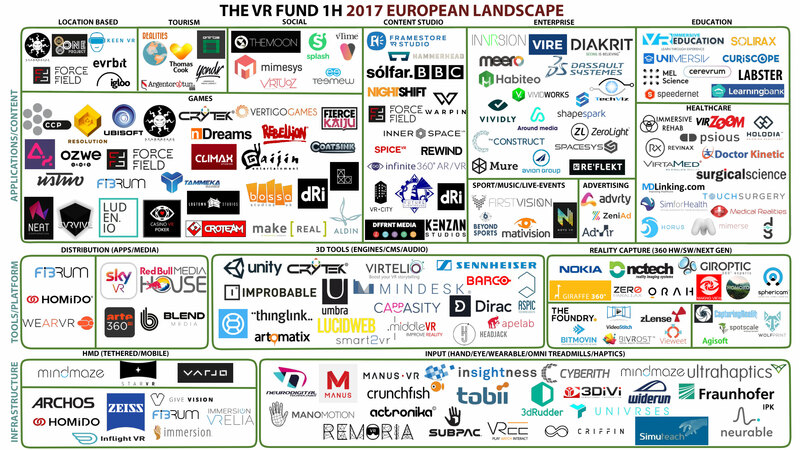 In collaboration with Brussels-based VR and WebVR consulting and software development company LucidWeb, it has released its second biannual report on the landscape of the European VR industry. The coverage of the report encompasses the activities of companies, and especially those that are developing infrastructure, tools, platforms and apps. The landscape is based on extensive research; hence The VR Fund and LucidWeb have added 68 new companies, with the total number now reaching 188 firms. The first findings show an impressive increase of 57% in the number of companies related to the VR ecosystem, compared to the results from the second half of 2016. As expected, the UK remains the biggest player not only in Europe but also in the entire EMEA market (see the news). France follows hot on its heels as the leader in the Eurozone, while Sweden manages to hold on to third place in the industry. Also, gaming remains the most competitive sector, as it saw a 38% increase, with 29 companies involved. In enterprise and B2B VR technologies, the report observes an increase of 55% during the first half of this year. In the still-evolving categories, we should note the sector of education, which had twice the number of companies this year, and also advertising, which contains an increasing number of start-ups. Virtual reality: A platform for film and media creativity? MIPTV report: What does virtual reality mean for TV?